For many years, our solar system was considered to consist of nine planets - until one of them got demoted to the category of "dwarf planet". Nowadays, apart from the eight proper ones, there are considered to be five of these dwarf planets orbiting the Sun, plus four other possible candidates. In addition, the solar system contains other stuff, such as the various moons of the planets, asteroids and comets. Now, we come to the concept of "big" again. If you were to, say, drive across America, you'd think that was a really long journey and that the Earth is a pretty big place. I live in the UK and I think that even a drive from Manchester to London is tedious and takes ages. But, in the context of the solar system, the Earth isn't big at all. 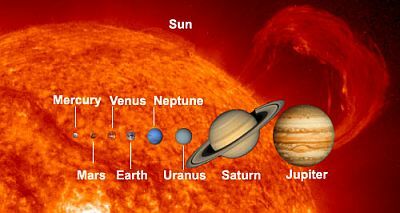 Take a look at this picture, with all the planets, to scale, arranged in front of the Sun. As they go in order from smallest to largest, you can see that Earth, though not the tiniest, is dwarfed by the big two, Jupiter and Saturn. But even they are reduced to insignificance by the size of the Sun, in the background. When it comes to the distances between their orbits, we start talking real gulfs of space (although nowhere near as awe-inspiring as the ones we'll be considering elsewhere on this site). There are two distinct sections of the solar system - the inner and outer. The inner part consists of relatively small, rock-based worlds that cluster quite closely around the Sun. Much further out, we have the outer section, featuring the gas giants. 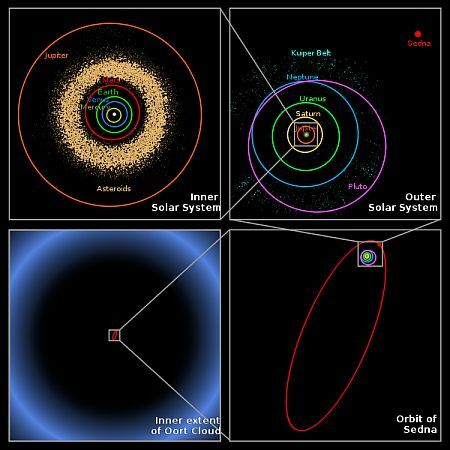 Beyond the orbit of Neptune, there is still more to our solar system, with such things as the Kuiper Belt and the Oort Cloud. Take a look at this diagram, which gives you some idea of the scale and positioning of these various objects. The Sun came first, obviously. It is generally thought that stars are created from molecular dust clouds that result from a previous giant star going supernova. Gravity draws the dust particles together and, in a sort of vicious circle, as more and more matter fuses, the gravity becomes stronger. This process also results in the central mass rising in temperature. Eventually, this heating up turns the mass into a so-called "protostar". Apparently, our sun began life this way. It is estimated that this process began around 4.6 billion years ago and lasted about 900 million years. 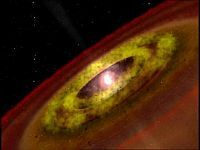 There was still dust and gas orbiting the young Sun and, by 10 million years ago, the outer gas giants, Jupiter, Saturn, Uranus and Neptune, had formed from this. During the next few million years, the four inner planets, Mercury, Venus, Earth and Mars, took shape. At around 4.5 billion years ago, the Sun became what is termed a "main sequence star" - in other words, a true star as we know it. Heat and light began to be produced through the process of nuclear fusion and the Sun has remained in that state till today. 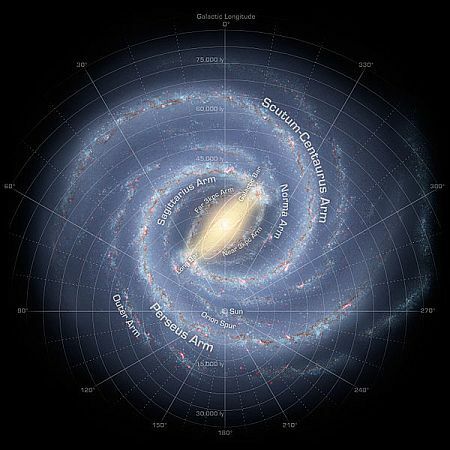 Our solar system is located on one of the outer spiral arms of the Milky Way Galaxy. As the galaxy is spinning, we are actually orbiting the Galactic Centre. It takes approximately 250 million years to do this and this period of time is known as a "galactic year". Since the Sun came into existance, the solar system has made 25 such orbits. The actual outer boundary of our solar system is considered to be where the solar wind meets the interstellar wind and is a distance of around two light years from the Sun. No man made object has yet left the solar system, but the two Voyager probes will, one day, do so. In 1999, the first other solar system was discovered, with three Jupiter-style planets orbiting round the star Upsilon Andromedae. 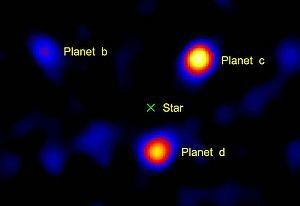 Such planets are termed "exo-planets", signifying that they're not part of our solar system. After that initial discovery, the flood gates seemed to open and many more were then spotted by astronomers. An interesting solar system is the one found around the star Gliese 581. It consists of at least six planets - and two of them, apparently, have that magic ingredient necessary to support life - water. It is estimated that there could be some 50 billion exo-planets in our galaxy alone. It's not inconceivable that some of these may contain intelligent life. Actual photograph of three planets surrounding the star HR 8799, situated in the constellation Pegasus, around 129 light years away. The star itself has been blanked out so its light doesn't obscure the orbiting bodies. The Sun is likely to continue in its present state for the next 5 billion years. During this time, however, it will be gradually increasing in temperature, resulting in the Earth eventually becoming uninhabitable. Also occurring within this period will be the small matter of our Milky Way colliding with the neighbouring Andromeda galaxy and eventually merging with it. 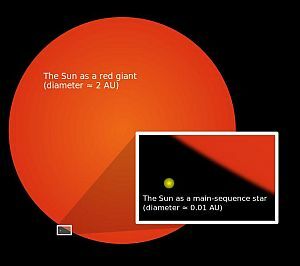 Assuming this event doesn't completely mess up the solar system, things will really start to happen at around the 5 billion year mark, as the Sun begins to turn into a red giant. This phase could last some 2 billion years, during which its increase in size will cause it to swallow up Mercury, Venus and Earth. At the end of this sequence, it will blast into space a great deal of matter, leaving just its core behind in the form of a white dwarf. Over the next 7 billion years, this will gradually grow cooler and dimmer, culminating in a black dwarf. The solar system will effectively cease to exist when the gravity of passing stars draws the remaining planets out of their orbits. This could happen by the time we've reached a quadrillion (that's 1,000,000,000,000,000!) years in the future. No need to panic, then.